Yup, we passed. New 1/2" copper ground 6 feet away from the first two (but daisy chained together - someone help me on the logic of this one, because I really don't get it at all) ... new outlets installed... woot. Now we have the framing inspection tomorrow, and the insulation spray foam guys are coming by to do a run-through on the house to see if everything's ok to spray foam this Thursday and Friday. The real problem will be finishing up all of the furring by Thursday. If we don't pass the framing inspection or don't get all of the furring done by Thursday, it could put a massive twist on the whole project. You see, the insulation guys are going on vacation for a week, which would leave us stalled until they return. Since we're planning on being in the house by October 15th this is really cutting it close. BTW: this is the picture I meant to add top the previous post; I figured I'd just add it in here. This was the wall that needed the outlet. 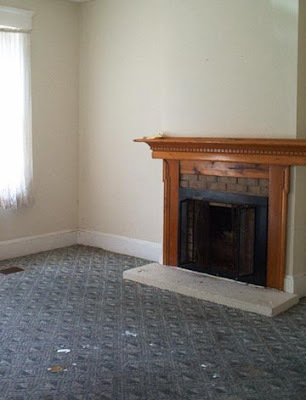 The old "livingroom" which will now be our dining room has always had a tacky fireplace in it. The mantle was made of crappy mismatched trim board, had 1/4" fake brick (yes, FAKE brick) facade and a gruesome glass and metal front. We've been avoiding touching it for almost a year now. But now that we're finishing up the furring in the new dining room, we decided to fur in the fireplace as well. 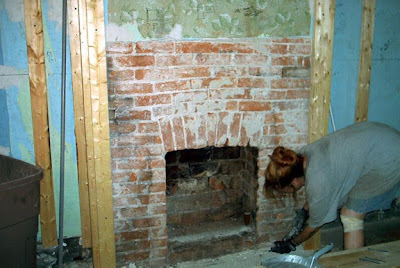 By this time, the mantle and the plaster were long gone. (The original picture is from before we bought the house. Love the carpet, no?) All that was left to do was to attach the 2x4's flat to the wall and basically encapsulate the fireplace. I started by attaching two 2x4's together to make my corners and attached them to each side of the fire place. Then I tore out was the metal grate. 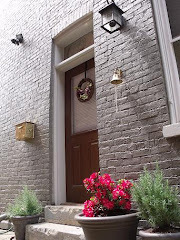 It loosened the fake bricks. So I pulled them all off. That took some of the plaster with it. So I kept going. Eventually, the room was filled with dust, my cleavage filled with sand, and an hour later, I noticed this cool brick archway. So THAT'S what was under there all these years.